It’s really interesting how her face kept changing, as if she wasn’t sure which form she wanted to take; so she took them all in turn. All of creation was She, it in her and she in it. ..that’s just what pops into my mind, I could be wrong..
She is a very wise, caring and healing Being, that much I can gather although I’m not familiar with her or her powers/aspects/characteristics. Cerridwen is also a symbol for transformation. 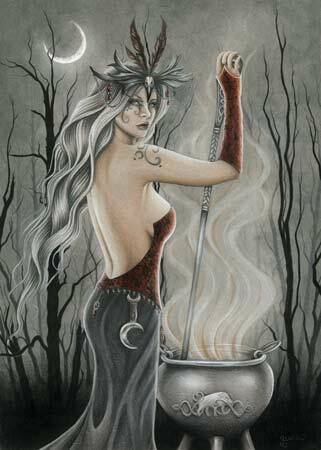 In the Welsh mythology, a student in charge of stirring her cauldron accidentically takes in a drop of its contents and acquires all the wisdom which was intended for her son. So he flees and with his newly begotten knowledge he transforms into an animal. Cerridwen of course is furious and chases him, every time transforming into the animal which hunts the prey that her student transforms into. Her student finally transforms into a grain of corn and is eaten by Cerridwen, who has transformed into a hen. She gets pregnant and gives birth to Taliesin. It was her intention to kill him, but his beauty appeased her and she threw him in the ocean. That’s a very interesting mythology. What happened to Taliesin after he was cast into the ocean? (I’m curious now XD) I mean, does the student’s essence live on in Taliesin, the fruit of Cerridwen’s body?